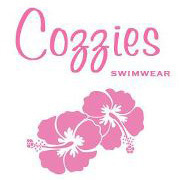 Cozzies swimwear is based in Hamilton, Newcastle NSW and has been established for over 7 years. Cozzies swimwear cater for women of all shapes & sizes. Our range of swimwear is styled for the real woman. Our range includes Full Piece from Size 8 to Plus Size 30. Separates in size 8 to 28 in many different styles. The need for Cup Fitting Swimwear has grown over the past few years and Cozzies stock Full Piece and Separates in Cup Fittings from B to J cup. Fashion, Chlorine Resistant, Slimming Swimwear, Plus Size, Mastectomy and Separates Swimwear to mix & match as you please. Bikini’s, Tankini’s & Full Piece in Chlorine Resistant (Chlorine Tough) and fashion styles. Bikini and Tankini Tops in many different styles, Bandeau, Triangle, Balconette and more. Swimwear Briefs in all styles from Tie Side, Hipster, Full Coverage, Boy Leg and a fabulous Lycra Swim Short. Lovely Full Piece swimsuits in all the newest looks including the latest Retro styles. Cozzies also stocks Mastectomy swimwear in Bikini’s, Tankini’s and Full Piece that are stylish and fashionable. Cozzies swimwear has trained staff to assist you in choosing the correct style and fit for you. We assist you in choosing different styles to try on and will honestly appraise the look and fit. At Cozzies swimwear it’s Summer all year round. So if you are heading off to warmer weather during Winter, are lap swimming, attending Water Aerobics or even Hydro Therapy Cozzies swimwear has the swimsuit for you.